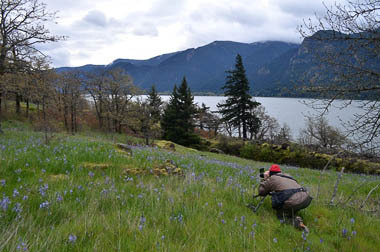 After a week of rain, the weather Gods smiled upon our April workshop and bestowed some fine weather for us to dry out a bit and get some photography done in the beautiful Washington Columbia Hills area of the Columbia Gorge. It wasn't a free ride however, as the wind really kicked in, with gusts at times well over 30 knots. 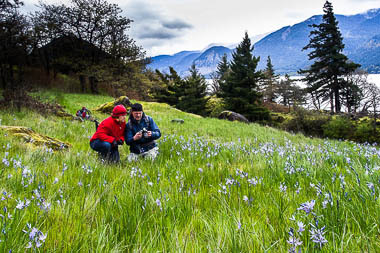 First stop was an area along the Columbia with a beautiful field of Camas flowers and wind swept trees. Wind swept it was, so we settled for higher ISO settings and also handheld shots to stop the action and get really low and close to the flowers. John Camp getting low to get close and personal with the Camas. Courtesy, Joanne Nelson. 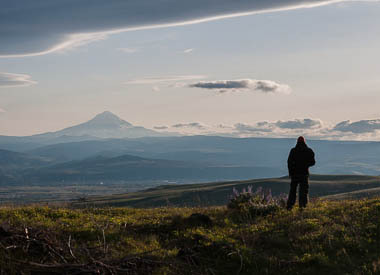 Next we headed to the Horsethief Butte area, finding just a little shelter from the wind at the east end of the Butte. 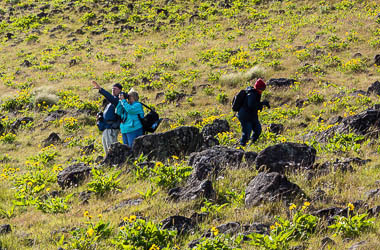 The Arrowhead Balsamroot was blooming, as well as other wildflowers, including Death Camas. We then drove to The Dalles for lunch at the Petite Provence and afterwards a review/discussion session. Following lunch we visited the rolling country side of the Columbia Hills and the Dalles Mountain Ranch. With hillsides covered with flowers, we enjoyed mostly sunny skies and some beautiful clouds to the west, with a subdued Mt. Hood in the distance. We made our way to the high point on the Dalles Mt. Road, then headed back, making a few stops when the light was right in certain areas. All was clouds to the west, so it was nice to have some sun, beautiful flowers and scenery the entire day. Thanks to all for a fun outing.